Christmas can be very stressful for us. Rushing around doing the big Christmas food shop, getting those last minute presents and making sure the house is spotless in time for the relatives. 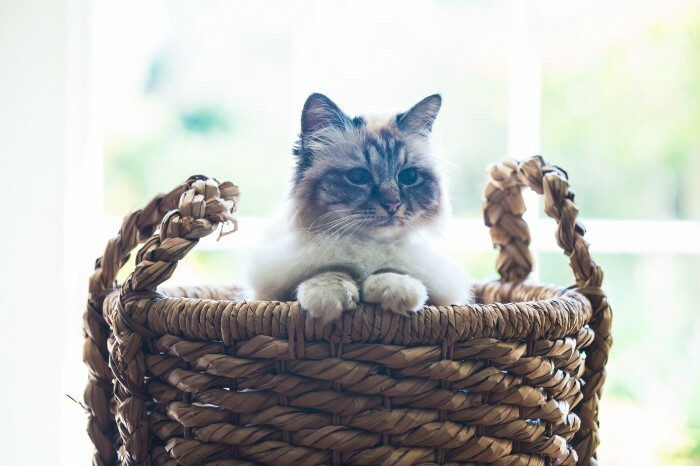 However the festivities can also be stressful for our cats and this is why at Arun Veterinary Group we have provided you with some helpful tips to make sure those special furry members of our family stay out of mischief and in good health! It’s human nature to want to treat yourself and indeed your cat at Christmas but foods such as Christmas pudding and chocolate can cause your cat to become very unwell. Bones, especially cooked ones, can splinter and cause intestinal damage. If you wish to give them a Christmas treat Applaws chicken breast is a great choice – it’s 100% meat and hasn’t got any nasty additives! As the nights draw in and get colder all our cats seem to want to do is stay snuggled inside. Cats can become very lazy over the winter and reduced activity levels may cause your cat to become overweight. Toys, laser pens and treat balls are all great ways to keep your cat active. Here at Arun Veterinary Group our vets and nurses can offer you lots of dietary advice as well as providing weight clinics to keep your cat in tip top shape. Candles are not only a fire hazard to your home if left unattended but can easily be knocked over by swishing tails or naughty paws! Make sure you keep lit candles well away from cats. Some cats will revel in the attention at Christmas time, enjoying the extra petting and stroking. However if you find your cat is sensitive to change they might prefer a more subdued environment such as a bedroom. Make sure you provide your cat with food, water and a litter tray if you intend to shut them away. The majority of cats will appreciate a quiet corner as the difference in their routine can sometimes be quite overwhelming. We suggest providing a cardboard box, igloo bed or allowing access under your bed so cats are able to hide away. As well as the decorations on the Christmas tree, the tree itself can be a hazard. Most cats love vertical territory and trees are their Everest, so it’s best to ensure they’re well secured. Cats can accidentally ingest fallen pine needles, which can get stuck in the throat or lower down the digestive tract. We suggest shutting your cat out of the room at night just to be on the safe side! Fireworks, party poppers, crackers and loud guests can be very upsetting to cats and can lead to unwanted behaviour such as spraying and scratching furniture. Why not try our Feliway® or Zylkène® products which are proven to help with stressful situations. Phone or drop in to the practice and speak to one of our lovely team if you need any additional information. Artificial snow, which can come in spray and solid forms is another substance which is toxic to cats if ingested and should be avoided. Antifreeze or ethylene glycol can be very dangerous if ingested. Cats can be attracted to it because it tastes very sweet. However, once swallowed it can cause severe kidney damage and can even be fatal. Make sure to keep any hangover cures locked away such as paracetamol, which is also highly toxic to cats. Some of us choose to decorate our houses with beautiful arrangements of flowers and other plants at Christmas time. However, many of them such as poinsettia, lillies, holly and ivy can be highly toxic to cats and can cause vomiting and or diarrhoea. For a full list of poisonous, toxic and harmful plants visit www.icatcare.org and search for “cats and poisonous plants”. Presents under the tree can be very inviting to cats, with their glittery holographic papers, bows and ribbon. Curious cats and kittens can accidentally ingest pieces of wrapping material in their excitement which can cause intestinal blockages. It’s therefore best to store these out of sight from hungry eyes. Remember that tinsel, hanging baubles and Christmas lights as well as wires can all be potentially harmful to your cat. If you suspect your cat has swallowed something contact us immediately. We provide our own out-of-hours emergency service, so you can rest assured that your cat will be well cared for day and night. Please check our website for our Christmas holiday opening hours. Merry Christmas from all at Arun Veterinary Group.